Food adulteration and its detection. New York and London : E. & F. N. Spon, 1887. Description : [1 l.] frontis. (col.), [3 l.] p., -328 p., advs., [12 l.] pl. (part col.) ; ill.: phots., tbls., in-text engrs. ; 23 cm. Photographs : Artotypes (see description below). Subjects : Food — Adulteration; Hygiene; Analysis. Author caption: By Jesse P. Battershall, Ph.D., F.C.S., Chemist, U.S. Laboratory, New York City. Appointed, Superintendent of analysis, U.S. Laboratory, New York City, 1873. "With photomicrographic plates and a bibliographical appendix." The photogravure plates, most of which represent the results of recent microscopical investigation, are considered an important feature of the book. And it is believed that the bibliographical appendix, and the collation of American Legislation on Adulteration, will supply a want for ready reference often experienced.—excerpted from Preface. 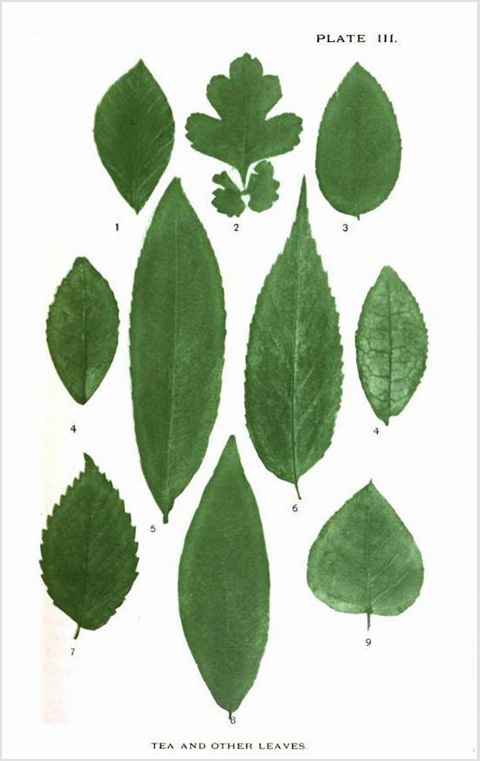 Plates I, II, and III are all color collotypes representing leaves of tea plants. Plate IV holds two photomicrographs of cream and milk (420X). Plate V holds two photomicrographs captioned, "Skimmed Cow's Milk X 420" and "Colostrum in Cow's Milk X 420." Plate VI holds two photomicrographs captioned, "Fig. 1, Butter X 400," and "Fig. 2, Oleomargarine X 400." Plate VII holds six photomicrographs of fat crystals, two from butter, and one each of beef, lard, butterine, and oleomargarine. Only the lard crystals are magnified 160X, the rest are by 40 diameters. Plate VIII, captioned, "Artificial Digestion of Fats," holds six photomicrographs of butter and oleomargarine that are time sequenced at 1 hour, 4 hours, and 12 hours (250X). Plate IX is caption, "Starches," and represents crystals of potato, maize, wheat, rice, bean, and pea, all magnified 145X except for the rice crystals which are magnified 450X. Plate X reproduces two schematic figures and two photographs representing a Ventzke-Scheibler polariscope. Plate XI represents line drawings of microorganisms found in Croton water (Fig. 1) and the Brooklyn Ridgewood water supply (Fig. 2). Plate XII, simply captioned, "Spices," reproduces six photomicrographs of ginger starch, adulterated ginger, cinnamon, cassia, cayenne, and adulterated cayenne, all photographed with polarized light.